What a delightful meeting we had! Even though I was a little under the weather with a UI, everyone’s feedback on the eclipse and the attendance of Beth and her husband Chad added some great discussion to the topics. With Dean, Silvio, Phil, Jim A., Keith and I in attendance, it was a great turnout. Dean, Beth & Chad, and Carol & I got to experience the total eclipse. Jim A. and his wife unfortunately got shut out by a stray cloud down in Carbondale, IL. Harry emailed me that he got to see it from Shawnee National Park in southern Illinois. Dean’s observations were from Missouri. 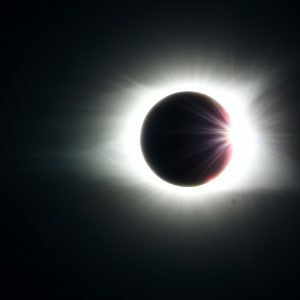 Beth and Chad lucked out because they were only a few blocks from Jim A. down in Carbondale but got to see at least 30 seconds of the total eclipse. After 7 days of pouring over “cloud cover” predictions, my son Curt, Carol and I headed to Gallatin, TN rather than Nebraska. We got the full 2 minutes and 40 seconds because the Triple Creek Park we watched from had the eclipse center line past right through it. See my Jim’s blog entry for a more detailed description of our experience. I have to credit my son for the photos of the event. Here is the “Diamond Ring” effect at the end of totality when the first glint of sun shines from behind the moon. The three major spikes in the corona that were visible during totality are very apparent at 1, 4 and 9 o’clock positions. Remember only 2,404 days until the next US eclipse on April 8th, 2024. After the eclipse briefing, we watched a couple of Uverse clips. The first dealt with the series “The Planets” hosted by Mike Massimino on the Science Channel. I learned in the “Venus” episode that scientists believe that Venus was a “water world” early in its history. But it lost its water because the lack of a magnetic field due to its slow rotation (it actually rotates backward) caused by an impact with a large object. The lack of a magnetic field allowed the solar wind to disassociate water vapor into hydrogen and oxygen and then blow both gases out of the atmosphere. Earth will have a similar fate starting in about 1.1 billion year when the Sun becomes 10% hotter and the oceans turn to steam. Earth will eventually become 4 times hotter than Venus’s 900 degrees! The second clip dealt with Peggy Whitson’s return from the ISS on September 2nd. Her accomplishments are amazing. With the latest 289 day mission (the second longest for a US astronaut), her cumulative time in space is 665 days (a US record and only exceded by 7 Russians). I also shared that Carol and I got to see an Iridium Flare. The constellation of 66 Iridium communication satelites are in Low Earth Orbit. Original plans were to have 77 satellites which is where the name Iridium (element 77) comes from. The satellites are in orbit in 6 planes around the Earth. Because of the shape of the satellites’ reflective antennas, the satellites focus sunlight on a small area of the Earth momentarity making it one of the brightess objects in the night sky and can even be seen in daylight. I used the “SkyGuide” app on my iphone to predict upcoming Iridium flares. There was one coming on August 25 at 8:11 PM from the Iridium 45 satellite due north and 36 degrees above the horizon with a -2.3 magnitude (planet Jupiter brightness). Carol and I went out on the deck a minute ahead of time and watched. Right on time there was a bright star-like object that flared for a couple of seconds. Pretty cool! Not a total eclipse but a good hobby for the light-polluted skies of Chicago. SpaceX is launching a new constellation of Iridium satellites that will not cause flares so the hobby will have a limited lifetime. SpaceX is placing 10 of them in orbit with each launch. Twenty are in space already with a plan to add 10 more every 2 months for a new fleet of 72 satellites. Scientists have a knack of coming up with catchy names for mysterious objects. The latest might be Hotdog Galaxies (HOT Dust Obscuring Galaxy). The belief is that these objects maybe merging galaxies with each having a black hole. 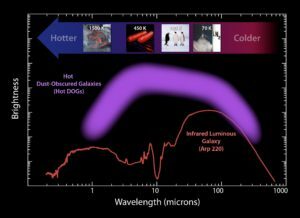 The black holes are feeding and emiting a tremendous amount of infrared radiation because the visible light is blocked by the dust in the galaxy. They may be 1000 times more luminous that the Milky Way and only 1 of every 3000 quasars would fall in this superlumious category. The Commercial Crew program is within a year of achieving their scheduled manned launches to the ISS. SpaceX plans to launch Dragon2 in June 2018 and Boeing just a couple of months later in August 2018. I showed the MASS Prize2 chart that a few of us were overly optomistic with picks for a launch in 2017 but time will tell whether we’ll need a MASS Prize3 competition. Check the “MASS on Commercial Crew” tab at the top of the page if you want to see more details of who guessed when. It has been a great year for SpaceX. With the launch of the Air Force X-37B space plane on September 7th, they have 13 launches in 2017 more than any country or other entity. After the launch, they successfully landed their first stage bringing their total to 16 overall recoveries. They also made their 12th supply mission to the ISS. This completes the original COTS1 (Commercial Orbital Transportation Services) supply contract with NASA which committed them to fly 44,000 lbs of supplies to the ISS over 12 flights for $1.6 billion. My total shows them at 53,400 lbs even though one mission failed. Now they will start on an 8 mission extension to COTS1 followed by at least 6 more missions in COTS2 starting in 2019. COTS2 will be interesting with the DreamChaser joining supply duties with the SpaceX Dragon and the Orbital Cygnus spacecraft. The Sun keeps getting into the headlines. This time it’s the largest solar flare in a decade which occured on the morning of September 6. The “Space Weather Enthusiast” site has some good coverage. The visible light movie shows the sunspots responsible moving the limb of the sun. The LASCO C3 movie shows material coming off the sun (CME – Cosmic Mass Ejection). It is a little surprising since the sun is heading toward its minimum activity period. The movie of the flare from the SDO (Solar Dynamics Observer) shows the x2.2 and x9.3 flares (a x2 flare is twice as intense as a x1, x3 is 3 times). The movie has an artificial green hue so our eyes can see the 131 angstrom x-ray emissions. Congressman Jim Bredenstine, a Republican from Oklahoma, was nominated by the Trump administration as the new NASA Administrator. He is a former Navy pilot who has expressed opinions about returning to the Moon before we head off for farther destinations. I think it would be a good idea to re-kindle our interest in CIS-lunar space but I’m not sure an active politician is a good candidate. I know NASA has had heads that were not engineers or scientists in the past but having a politician is a first. Part of my worry is he is also a climate change denier. We finished with an excellent over-view by Dean of NASA’s new heavy lift rocket SLS and its Orion capsule. Much of the rocket will be repurposed components of the Space Shuttle. The first stage will have 4 of the shuttle’s main engines. It will have two solid rocket side boosters like the shuttle but they will have 5 segment rather than 4 so that they will burn longer. And the first stage fuel tanks will use the same manufacturing techniques as the external tank on the shuttle stack. My hope is these design decisions were made to expediate development and lower development costs. But when I read that NASA has already spent $19 billion on SLS and its predecessor Ares, $13.9 billion on Orion and will have spent $43 billion by SLS’s first flight in 2019. I’ve read that NASA’s overhead on Orion is 56% and a whopping 72% on SLS. That means out of every $1 of appropriated funds only 28 cents makes it to the contractor cutting metal to manufacture the rocket. NASA’s overhead on the current commercial programs is only 14%. 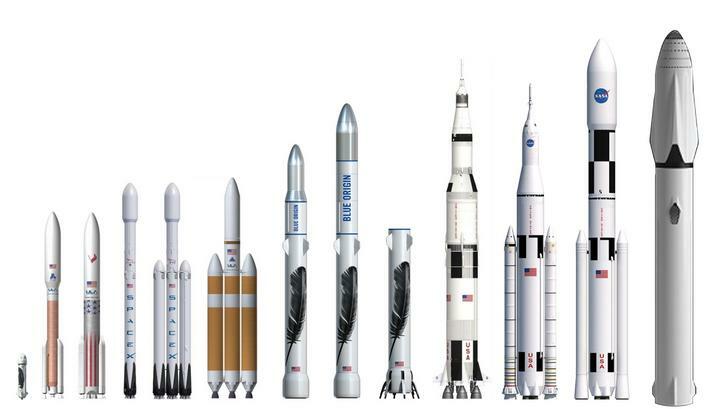 I worry that SLS will be too expensive to compete with commercially developed heavy lift rockets like SpaceX’s Falcon Heavy and Blue Origin’s New Glenn. SLS will definitely be the Cadallac option with a 70 mt (metric ton=1000 kg or 2200 lbs) initial lift with the Block 1 version. Subsequent versions will increase the lift to 105 mt in Block 1B (new second stage) and top out at 130 mt in Block2 version (new side boosters). SLS is a totally expendable rocket without any reusablility except for the Orion capsule. Falcon Heavy in its expendable version has a LEO (Low Earth Orbit) capacity of 54.4 mt for a cost of $90 million dollars. Its reusable version will take a 30-40% lift capacity hit. SLS project managers say the annual overhead costs will be about $2 billion and each launch will add another $1 billion. If you launch once a year that is $3 billion for 70 mt versus $90 million for 54.4 mt. When you do the math SLS is over 25 times more expensive for each pound in orbit than Falcon Heavy. Specs on the other commercial heavy lift rocket, the New Glenn, are a little more sketchy because it will not fly until 2020 and needs the development of the BE-4 engine which will use liquid methane a new fuel for rockets. New Glenn will use 7 of these engines to lift 75 mt into LEO. New Glenn will also come in a reusable version with a reduced lift of 45 mt. 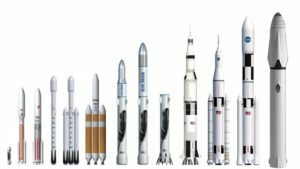 I still think SLS will be the rocket with the most capability. It will have the heaviest lift and the biggest faring of 10 meter in diameter. Imagine being able to orbit payloads where 33 feet is the smallest dimension. There will be savings in money and time by launching things with the fewest launches and the least constrained dimensions but I’m not sure it will overcome the enormous extra cost. SLS’s first launch won’t be until 2019 and its second launch won’t be until 2023 because that launch will be manned and they need to develop the new second stage (Block 1B) for that. The first Falcon Heavy launch on the other hand is scheduled for November 2017. Elon Musk of SpaceX already has 2 rich customers willing to pay him to launch them in a Dragon capsule on a Falcon Heavy around the moon in 2018. In April of 2017 NASA finally created some missions for the SLS beyond the initial EM-1 (unmanned) and EM-2 (manned) ones. The Europa Clipper is one and missions supporting the DSG (Deep Space Gateway)are the majority of others. DSG is envisioned to be the successor to the ISS but be in orbit around the moon. My hope is we get our investment back on the SLS/Orion by building this infrastructure around the moon and sending probes on missions that only the SLS can do. As we closed the meeting, Dean presented a great idea of incorporating a teaching of each chapter of the original Cosmos series into our meetings. He has a study guide to support the process and we can also research how much new information has been discovered since the 1980s program. Everyone seemed up for the project. Another great update, as always, Jim! Thanks for the overview! Always enjoyed!